During the course of a PhD you are continuously finding out things that you, or anyone else, never knew before. That is the point, to present unique and new research at the end of it all. But this simultaneously puts you in the state of not knowing anything with impostor syndrome playing a big role in academia. No where does this become more evident to you than when you have to write it all up in your PhD thesis. It is an all consuming process, even if you try very hard for it to not be. 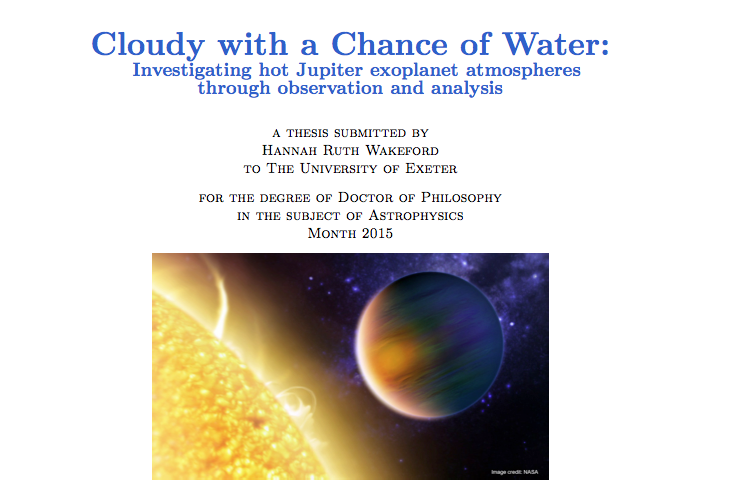 It is now the end of March and I have just handed in my PhD thesis titled: 'cloudy with a chance of water'. It is a short 181 page document outlining a majority of the work that I have conducted as a scientific researcher at the University of Exeter over the last 3 1/2 years. A PhD in the UK is a very learn on the job kind of endeavour, and it is an experience that seems remarkably unique to each person considering we are all going for the same thing. A PhD is so different for different people, this is not intended as a formula to writing a thesis, nor is it to say that you should be able to work this way as well. Merely a document of my experience and process through it all and I hope that in a little way it can be reassuring or simply informative to people going through the same process now or in the future, and perhaps a little nostalgia kick for people who have already gone through this all before. 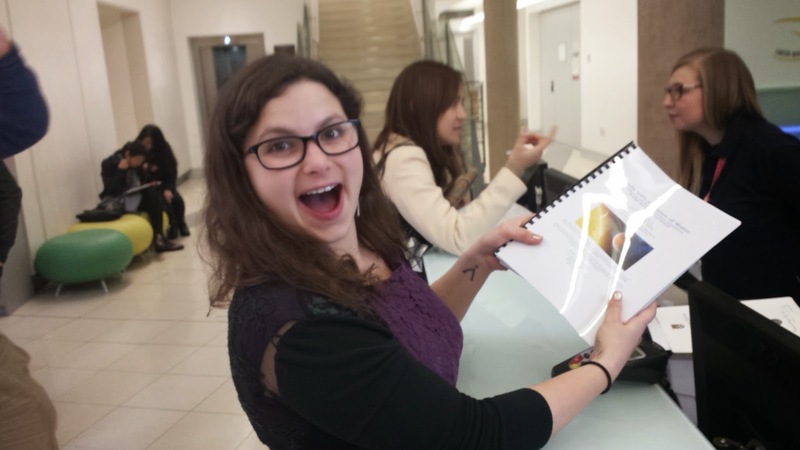 The write-up, I suppose, officially started November 2014, giving me five months to complete and hand-in. That seems about normal. Though some people if needed have been able to write up in less than three weeks, or take over a year. The write up is a weird process and it really depends on the work you have done as to the final format that process takes. Some people have one large project that takes the whole PhD to complete and no papers can be written before the whole thing is done, so the write up is one long detailed story. Others do lots of little projects that form multiple papers as they go through their PhD which can then be stapled together in a vague order to be examined on. My fell somewhere in the middle of these two. Over the course of my PhD I have worked on a fair few projects all focused around one thing. Because my work looked at observational data (experiment) and analytical studies (theory) the hardest thing for me felt like the definition of the narrative that would bring these together. It was a long time before I could work out where my first observational paper would slot into the whole story as most of the first part of my thesis would focus on the new technique we were using which was developed after the first paper went out. I wanted it to read more like a book where the introduction to each thing appeared as you went along rather than all lumped into the introduction where you would have to flick back to remember what you had read. Once this was all in place it just took a little bit of work to get the right words in place. The section and sub-section headings changing right up to the week of submission. I just had a look back through my files and it appears the first figure created specifically for the thesis was made on December 8th so it was a least a month in before I had any idea where I was going with things. All of your writing will be crap the first time you put it together. The important part is that you let your mind relax and spill onto the page all of the different ideas you want to incorporate into the work. The sentences don't need to make sense at this point you just need a vague idea of what needs to be there. 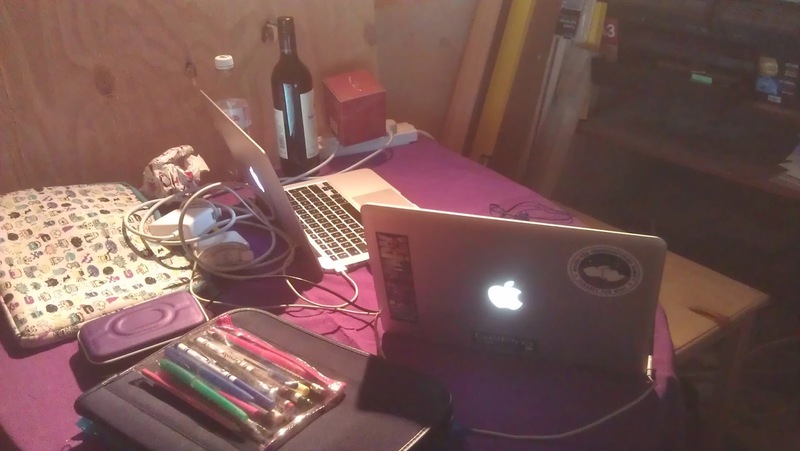 I can't even count the number of bottles of wine I drank over the Christmas break working at my parents place on the makeshift desk they set up for me in the front room so I could work whenever I had a spare minute. In fact on new years eve my Father and I were child sitting round my sisters house watching The Newsroom drinking a LOT while I was typing up the analysis process I go through for each of my observations. Unfortunately for the wine industry the drinking tailed off considerably for the write-up towards the last few months as I edited the structure and formed slightly more coherent sentences from the waffle. But I cannot stress this enough: just because you are writing up does not mean that life has to stop and you cannot take time for fun. Go out with your friends, take an evening to do nothing but watch Netflix, celebrate birthdays and holidays when you can. The majority of comments I have had over the last few months are along the lines of 'you seem so calm', 'she is the calmest PhD student I have ever met', and 'it's annoying that you not panicking right now'. That last one came from my friend and housemate who handed in his PhD thesis in Feb and passed his viva in March. There was a distinct moment when his brain went into panic mode over the write-up and a point a month before hand-in that a constant state of stress seemed to kick in, so everyone was just waiting for me to go nuts I suppose. Now I am not saying that I was calm all the way through. There were definitely some bouts of absolute panic and immense amounts of self doubt, but I did what I always do and gave myself something else to channel my worry and stress onto. If you know me or have seen me at work you will immediately notice the slight air of chaos surrounding my desk. It is not just the piles of post-it notes of every color, or the piles of papers and pens all over the place; it is the tiny person sitting there arms flailing looking for something or running off to one meeting or another grabbing something seemingly random as she ruses past you. I only wish I had gotten a picture before I decided to clean it all up after hand-in, but it seems every photo I have has been carefully framed to minimise the amount of mess visible. I need to be constantly distracted to get anything done. I know it seems strange, I find it strange too. But you know how it helps to have the background noise of a coffee shop to get work done? Well I need that ten-fold. If I do not have people moving around me and talking or something playing on the TV or a series of tasks to complete I will find it very hard to sit down and get one single thing done. There was one point where I had my two laptops playing different things with two separate sets of headphones in and a video on mute on my monitor just so I could concentrate and remember what I was working on. And the only reason I was allowed to have two laptops from work in the first place was that my first laptop, Louie, decided that it could not cope with the multitude of tasks I require to perform simultaneously any more. That said a lot of my normal routine fell to the wayside during the final few months. I have not kept up with any of my TV shows, save one or two, and a week for me is normally set around which ones I need to watch next. I have little to no idea what movies are out, have been out, or are coming out. All of my departmental 'social secretary' roles were handed out to other, younger people to take over, I relinquished my keys to the boathouse and passed on my turn on the bar rota at the local scuba diving club. But saying all of this makes it sound dramatic. I did make sure to hold onto some things, Simon and I kept producing The Science Hour on XpressionFM right up to the last week before hand-in. 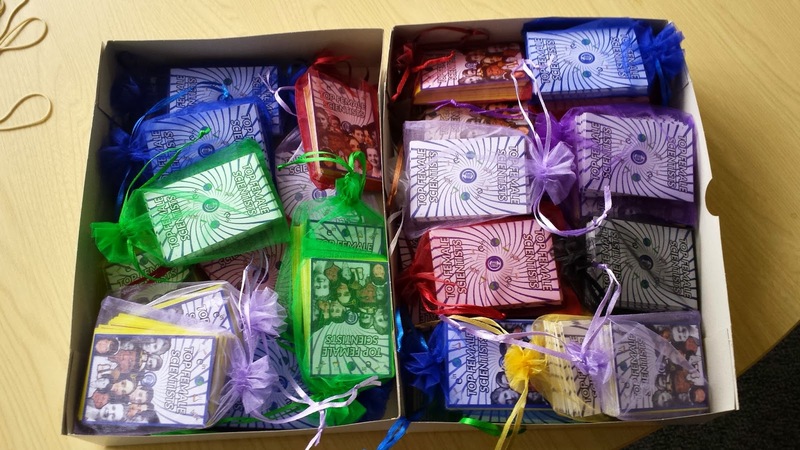 We also created a Top Female Scientist Card Game that went viral and are now mass printing sets to send to schools. 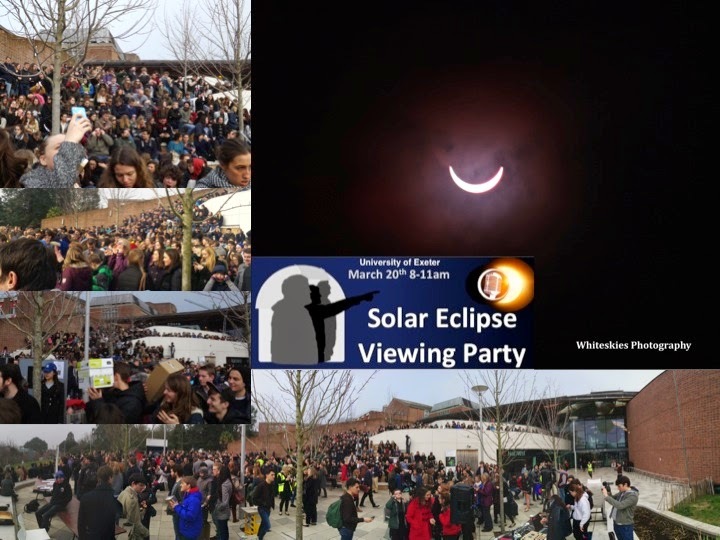 And for some strange reason I decided that it would be a good time to organise a Solar Eclipse Viewing Party at the university. Well that one is not entirely my fault on the timing as I have no control over such celestial events. All of these served as happy distractions so that my thesis work became the thing I did when I was taking a break rather than the other way round. It is strange but since the write-up life has got fuller not emptier. I spend more time with my friends happy to do nothing for a while, I am more relaxed and content than before. I just hope I can find something to distract me in the next month so I don't freak out about the impending examination viva. The following are my Acknowledgements from my thesis, and in sharing them here now, I think it sums up what I was trying to explain above. "None of this would have been possible without the financial support of the UK Science & Technology Facilities Council (STFC). The research leading to these results has also received funding from the European Research Council under the European Union's Seventh Framework Programme (FP7/2007-2013) / ERC grant agreement no. 336792. Okay, now that we have the formalities out of the way it is time for the juicy bits. I have so many people to thank for their support throughout this doctoral endeavour so I shall attempt to do so here. This is for the people who will likely not read any further, save scanning the witty quotes marring each new chapter. Yet, for all of you I am still profoundly grateful. To all who have ever shared an office with me, sorry, but I do believe that I warned each and every one of you in advance. I am especially thankful to Emily who stopped me from freaking myself out by allowing me to worry about her. Also, to Paul, the time vampire that he is, Tom Evans and Tiffany whose knowledge and patience far exceed that of my own. To all the goofballs in the Astrophysics group who for some reason allowed me to take over and dictate their lives for a few nights a month/week. It has been a fantastic few years and for the most part it kept a smile on my face. To Alex Pettitt, Moncho, and Simon who aided in my productive procrastination and helped me shout science to the world, I am definitely going to miss it. I am also thankful to Matthew Bate who gave me the confidence and belief that I could get away with it in the first place. To Andrew for enabling the crazy, Jon for joining in with the crazy, and Tom Wilson for embracing the crazy, I am sure he is still trying to convince himself that he knew what he was getting into. To David Amundsen who has been there through it all and even had to live with me to boot, I (and my family) cannot thank you enough so I will just say `Well done sir, well done'. My penultimate thanks goes to my supervisor David Sing. The freedom and genuine support that you have given me over the last few years taught me how to be a scientist and for that I cannot repay you, I only hope to one day pass it on down the line. Finally, to my family who always encouraged me to do whatever the hell I wanted, within reason of course, and never wavered in their support and pride. That, and our shared love of Stargate, could not have done this without Stargate. "